There is a Coupon Category built in to Artisan, this category can either be used to create your own coupons or to use automatically or manually generated numbered coupons. This is the built in Coupon Category in Artisan. Automatically generated Coupons will be assigned to this category but you can also manually create a coupon item and assign it to this category. If this field is blank the default tax rate will be used. This means the discount comes off before tax is calculated. If you make the category Non-Taxable then the coupon will come off after tax is calculated. 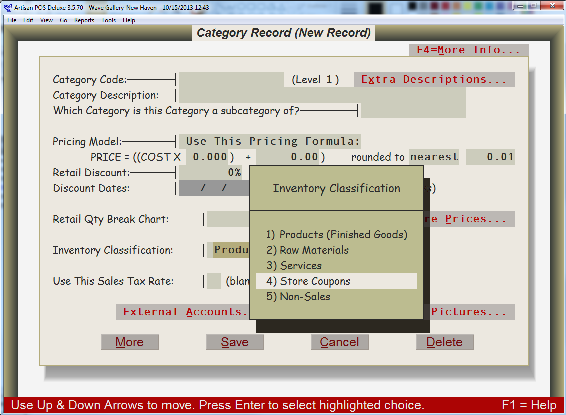 You can create your own coupon category but to do this you need to change the Inventory Classification to Store Coupons. These will not be numbered coupons but instead items that you can use in the Cash Register for coupons you have published or issued. This category could also be a Sub-Category of the built-in Coupon category. This is an example of how you would setup a Coupon Item in Artisan, this is not the built in coupon item but rather one you would use if you had published a coupon that customer will bring into the store. You can either put this item in the built in Coupon category or a new coupon category that you created. Enter the amount of the discount in the Retail Discount field, this can either be a % that you want taken off the entire sale or a specific dollar amount. 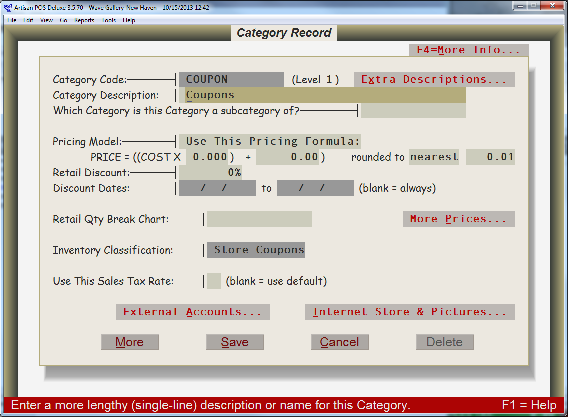 Above is an example of how the coupon would be used in the cash register screen when it is presented by the customer. If you are using a Loyalty Club numbered Coupons will be issued, you can also create these manually by going to Accounting=>Outstanding Transactions=>Store Coupons. You have the option to see a list of un-redeemed coupons that were previously issued. 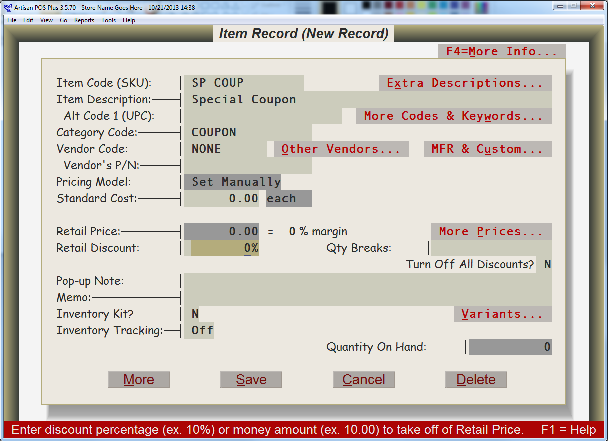 If you want to manually generate a coupon you can use F3 on this screen for a new record and fill in the required fields. To redeem a numbered coupon type C in the item code field, you will then be prompted for the number of the coupon that is being redeemed. Enter the number in the pop-up and the coupon will be entered on the sale and the discount issued. Percentage coupon will take that percent off of each item on the sale, a dollar off coupon will only take the discount the sale by the dollar amount.